Gender equality is now a dominant theme throughout the world, and is being pursued in various ways by international organizations, governments and industry alike. The Customs world is no different as it tackles the issue, bolstered by ‘gender mainstreaming’ being part of the WCO’s approach to gender equity. A sterling example is that of Iceland Customs, which has taken up the theme with vigor, and is now leading efforts to bring about gender equality with the recent implementation of an ‘Equal Pay Standard’ in 2016. In this article, they take us on the Standard’s journey: from development to implementation to recognition of the certification process. Standard ÍST 85: 2012 – Equal Pay Management System – Requirements and Guidance, commonly known as the Equal Pay Standard, was published by Icelandic Standards in December 2012. The idea was to create a system that could confirm that women and men, working for the same employer, were paid equal wages and enjoyed equal terms of employment for the same jobs or jobs of equal value. But Iceland’s journey on gender pay parity began much earlier. Collective agreements between the main parties in the private labour market already contained a clause on the development of a certification scheme for gender pay equality and this was followed by a provisional clause, on the same subject, in the Icelandic Act on Gender Equality No. 10/2008. What was lacking, however, was a standard that could be applied by all organizations across the board. This led, in the autumn of 2008, to Iceland’s Ministry of Welfare, along with the Icelandic Confederation of Labour and the Confederation of Icelandic Employers, beginning work on the development of the Equal Pay Standard. Icelandic Standards (IST) agreed to supervise the project, establishing a Technical Committee (TC) to oversee the work. The TC included the sponsors of the project, as well as representatives of the Centre for Gender Equality, the Ministry of Finance, the Federation of State and Municipal Employees, the Association of Academics, The Icelandic Association of Women Entrepreneurs, the Association of Local Authorities in Iceland, as well as a couple of private companies. To take the project forward, the TC set up a working group, which was responsible for drafting the text of the Standard with the aid of experts in selected fields. The group decided to use the ISO’s International Management System Standards – for example, ISO 9001 on quality management systems and ISO 14001 on environmental management systems – as models. The Equal Pay Standard describes the process that companies and institutions can follow in order to ensure equal pay within their organization. Moreover, the Standard aims at implementing effective and professional methods for pay decisions, as well as effective review and improvement mechanisms. It is applicable to all companies and institutions, regardless of their size, field of activity and staff gender composition. Companies and institutions that implement the Standard, and obtain the necessary certification, can thus improve their human resource (HR) management and pay policies. In addition, the Standard can be used to prevent and eradicate all forms of discrimination, and improve an organization‘s image as a fair employer. An organization adopting the Standard would start with an assessment of its current pay policies, classify jobs, according to equal value and conduct wage research on the basis of the classifications, as well as formalizing policies and processes related to pay decisions. These changes need to be reviewed regularly, checked and validated by management. Once an organization has implemented the changes, it can apply for certification of its pay system based on the tenets of the Standard. 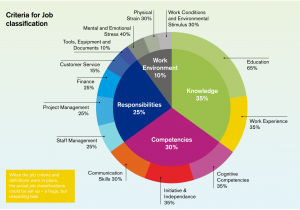 Job classification plays a big part in implementing the Standard, and is useful in general HR management, particularly with respect to manpower analysis and planning, recruitment, job development plans, and performance appraisals. act as a tool to fight gender-based wage discrimination. As the Standard is new and no obvious models existed prior to its development and implementation, it was pioneering work – work that Iceland Customs took part in. Today, Icelandic authorities proudly view the Standard as a valuable contribution to the global gender equality and diversity dialogue, which Iceland Customs are happy to be a part of – given its firm commitment to a fair and equitable workplace. Iceland Customs first put together a project group consisting of HR specialists. The group´s main tasks were to come up with preliminary definitions for job classifications, and criteria for job classifications. Thereafter, a focus group comprising all top and middle managers was set up. They reviewed and later accepted the definitions and criteria, ensuring a common understanding of all the elements. What should, however, be noted here is that management buy-in is vital to the success of such a project. When the job criteria and definitions were in place, the actual job classifications could be set up – a huge, but rewarding task. The classifications provided the working group with a broad overview of all jobs within Customs, and what their value was considered to be. It is Important to remember that what is being evaluated and classified is jobs – NOT employees. The final result was that all jobs were categorized in terms of their comparability and equal value. Implementing the standard was pure quality management. What this means is that in order to comply with the demands of the Standard, strategic and quality management working methods must be applied. the annual report must be accessible to all staff. In order to facilitate the fulfillment of the obligations of the Standard and to promote the issue of equality even further, Iceland Customs appointed an equal rights officer whose responsibilities include monitoring and reporting on these issues. As with other management standards, certification is done by an independent accredited third party institution. In order to receive certification, Iceland Customs had to undergo a thorough compliance audit, aimed at ensuring that it fully met the requirements of the Standard. This certification process was the first of its kind and was conducted in September 2016. By implementing the Standard, Iceland Customs has established the organization as a fair and equitable employer, resulting in employees now firmly believing that the wage system is transparent, predictable, and based on equality and fairness. The Standard will also assist Customs in managing HR matters more effectively, especially recruitment. The Standard is in the process of being translated into English, which means that organizations outside of Iceland will be able to access it more easily, and use it to assess their pay policies as well as equality issues. It is set up in such a way that it can be used by any company or institution, irrespective of location, size and field of operations. Early on during the pilot project, participants expressed a wish for some sort of recognition that they had been certified. They wanted a logo or an award that a company or an institution could display, which would visibly demonstrate the equal pay ethic of the organization. Therefore, in 2014, a competition was held in collaboration with the Iceland Design Centre for the design of an Equal Pay logo. There was record participation in Iceland with some 156 designs being presented for consideration, out of which the current Equal Pay logo was selected. “In the image of the logo you can see a compass, a stamp, a runic representation and the smiling faces of two different individuals. In its shape, the mark represents a coin or a piece of money, thus showing that these two individuals were measured equally in terms of pay. The mark can be used internationally, being of a unique and descriptive purpose, while recalling its Icelandic origin“. The Equal Pay logo emphasizes the fact that the Standard can be used by any employer (one that employs women only, men only or is gender neutral), thus preventing all forms of discrimination, not only between men and women, but also on the grounds of origin, faith, sexual orientation, etc. In addition, the logo can be seen as a ‘smiley’ or a stamp of quality and equality, usable anywhere in the world. Iceland hopes that the gender equality logo will be recognized internationally as a mark of equality that will be sought after by institutions and companies of all shapes and sizes. As a mark of Iceland Customs having not only implemented the requirements of the Equal Pay Standard, but also being the first organization to obtain certification according to the Standard, the Ministry of Welfare awarded it the Equal Pay logo, which Customs proudly displays as a badge of honour to mark the fact that it is a fair and equitable employer.